SottoStudios is out to reimagine the Mall. This article is Sotto's highest read piece currently on Linkedin. Westfield's New Century City upgrade adds a "home away from home" feel and trendy look. Southern California's Mall developers (Westfield in particular) are fighting the current "brick and mortar" retail crisis that is shuttering many big box mega stores by "getting personal." Experiential design is finally taking hold for some with swinging benches, lounge chairs, fire pits, fountains and lots of green. All of this "social flypaper" is threaded right through the middle of the many of the same shops we're used to seeing, hoping to prop up the aging mall business model. Sure, there are more wellness and yogurt options to fuel those outdoor back rubs. 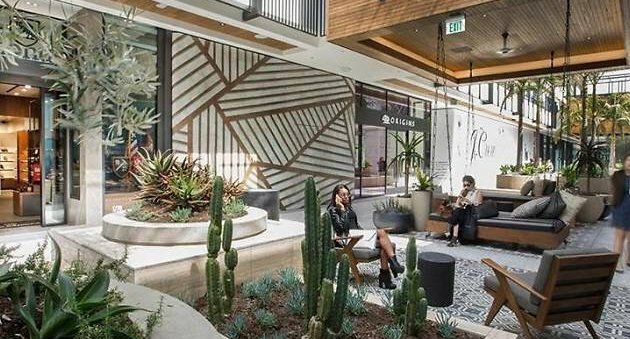 It seems that weaving retail into "outdoor rooms" as a millennial alternative to your apartment balcony and rusted hibachi may be a novel way to draw crowds. It got me there and it felt great. Internally dubbed "lifestyle" centers, these new offerings did make me wonder how truly "social" these areas are, as we see so many scanning their devices. What next? A coffee? New shoes? A scented candle? Devices are hard to compete with, or maybe those lounging shoppers are conducting a fireside shopping spree on Amazon? The question is, does creating a "village" really result in more sales, or do we have to do more long term than transplant people from their sofa to ours? The conventional wisdom would be that they are more likely to buy something in a retail living room than their own. Stores have a village strung within them, but are sofas and fire pits enough long term? We wonder too. As an experiential designer it excites me to see this new direction and feel that it is only the groundwork for the next evolution. Even the appeal of movie theaters as a magnet is in question so it's all an open question. These big boxes that become empty are, of course, terrifying to the mall operators who are used to leasing space versus reinventing their business. We see those boxes as big opportunities to reimagine something exciting. Change is here. Ironically, Amazon's Jeff Bezos said it best when asked how to cope with continual change. He pointed out that it's best to look at the things that will not change and build on that. In his case, price and speed of delivery. No one wants something more expensive and slow to your door. People will always want to get out of the house at some point, especially as long as there are dysfunctional families. In the case of experiential design, we look to build on creating emotion and really start with that "wow!" and work backwards into how to express it. We look for constants that will bring people out repeatedly. We see sensory design as "systems" and this is important as the mall is holistic experience, something lessors seldom understand as leasing is by necessity a piecemeal negotiation. In time, the identity of that mall experience can be highjacked by the cumulative effect of many disparate lease deals. In fact, the tenant mix to us are like an orchestra, where the symphony takes precedent over the soloists. Are retailers partially to blame? Maybe. As a shopper, at times have you encountered "brick and mortar" retail interactions to be a negative experience compared to online solitude? I've sensed that the staff in too many cases have been cheerily trained to "over serve" you by approaching endlessly till you leave, dispensing hollow compliments, and other annoying practices. Each staffer is oblivious to their teammates so they sequentially approach you with the same canned pitches. Devices may have shifted our social expectations of a good experience to an "on demand" social model, not a "stimulus and response" fake chat. Perhaps we only want interaction when we need it, versus a human pop-up ad? Seems the online world often has more product information and you can browse without interruption. See how conditioned I've become already! So there has to be a bigger and better reason to go than that. Best Buy and others are looking to let you try before you buy. Love that too. To that end, it seems "the Village" concept of weaving in social culture as a magnet, strives to rise above the tenants themselves, like "San Francisco" is the destination and Ghirardelli affirms it. Sounds good. In the "lifestyle" center business, there seems to be more "creative risk," as customers are coming for the shared experience of the mall with shopping as a repeatable byproduct. The better stores stoke this by being "merchants", rather than "retailers". "Merchants" continually bring new things that they know will thrill their customers (like Trader Joe's, or Apple used to, ) but "retailers" have no idea why something sells, they just dispassionately offer it. You want to enter a store and feel the fanatical love the staff has for their product, see what's new, perhaps check in with that staffer who is an expert on the product you saw last time. In the old days of buying records it was the "roadie" behind the counter that toured with the bands you love and knew what was about to be released. To me, "authenticity" in retail or the lack of it, is one reason online is winning. As you see, the tenant mix becomes far more curated as you are trying to satisfy or affirm an aspiration in the shopper. It's not just the social spaces, everything matters when you are creating a system of experience. This kind of "hard fun" is exciting and a really good assignment in the reimagining process of what mall can be. It's creating that feeling of well-being, reassuring us all that our quality of life exists and that we ourselves are relevant within that. Coming from years in theme park design, "lifestyle"malls seem to have become more themed like Disney's Main Street, and to some, Disney's Main Street has become more of a mall. Funny how that "art imitates life imitates art" thing works? Exciting times. See you at the firepit. Edward Sotto runs SottoStudios/LA, an experiential design and brand studio in Los Angeles. More articles from Eddie.